Diwali's the biggest festival in India. Even President Obama celebrated it. I guess that says it all. Back in Kolakata we celebrate Kali Pujo at the same time. Bursting firecrackers is common to both Kali Pujo and Diwali. The main food association with Kali Pujo was mutton curry as traditionally there used to be a goat sacrifice or 'patha boli' during the puja. That is largely a thing of the past though I won't be surprised if it still happens at the legendary Kalighat Temple of Kolkata (never been there myself). Can't say that I miss Kali Puja as much as I miss Durga Puja. My main association with Diwali in Mumbai is the longish holiday and the box of mithai one normally gets at work. This time we just have a three day weekend versus the four to five day break one has got used to. 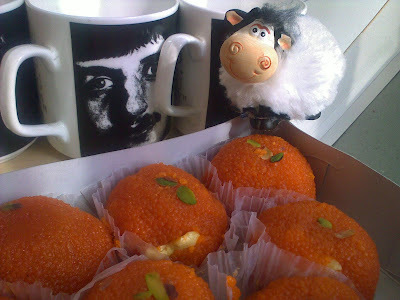 But it was niceto get a box of sweets from office as well as a Diwali lunch for all. Especially after the big bad recession last year and the austerity drive in Corporate India. Well at least my new cubicle mate (about to topple into the box of sweets in the picture) plans to polish of the laddoos (sweets) while we think about such weighty matters. And you enjoy a nice, sweet Diwali. The first photo looks like ferrero rocherin a jar, am I right? Then you are a lucky fellow to even have a glimpse at those chocolaty beauties so many together. Thank you Sudeshna and wish a great Diwali too. I believe its quite big down South. The picture in the header was a jar of truffles in the Sprungli chocolaterie. Sprungli of Lindt and Sprungli fame. The laddoos were soft and juicy too.